Top-level domains (TLDs) are the name spaces of the internet. We're used to seeing .com, .org, and .net, but the expansion of generic top-level domains (gTLDs) in 2012 allowed for individuals, brands, and other organizations to secure their own gTLD. .discover was Discover's first gTLD, and would allow Discover the ability to pursue simplified URL structure. I was the lead designer and developer for the Network Information Center (NIC) page. A NIC page is an Internet Consortium for Assigned Names and Numbers (ICANN) requirement for any gTLD. There are not many prescribed requirements for these pages, which presented a challenge to our project team: create a unique experience that breathes life into the requirements, translates the Discover brand into a digital "flag in the sand," and maintains compliance with Discover's digital style guidelines. After a review of other brands launching their own NIC pages (Marriott, Las Vegas, BMW, Chase, and Google, to name a few), I moved forward by proposing three different responsive designs. I chose to use a full-width hero image to capture the aspirational quality of the Discover brand and give a visual cue to the company's mission of providing a brighter financial future. In order to keep the user interface free of clutter, the ICANN-prescribed information was implemented in frequently-asked questions format using collapsible accordions. To achieve this project, I collaborated with our domain and digital style managers, senior digital and brand leadership, creative services, external relations, legal, and network operations. 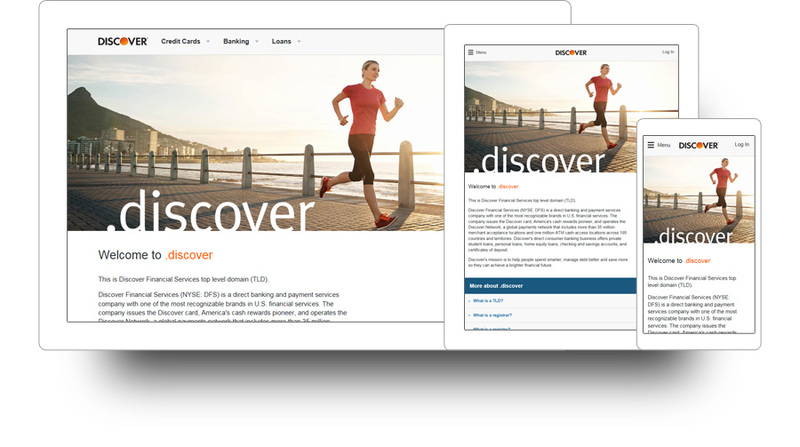 The result was a clean and easy-to-use design that fulfilled ICANN requirements and allowed the Discover brand to be expressed in this new venture. This project was the first step towards Discover being able to create simplified web experiences utilizing a gTLD. You can visit the live page at http://nic.discover. Disclaimer: This webpage is the intellectual property of Discover. It is represented here for the sole purpose of demonstrating the design, technical, and creative abilities of Patrick Puckett. Copyright is available on http://nic.discover and maintained by Discover.